With the completion of special counsel Robert Muller's investigation into Russian interference into the 2016 presidential election, attention now shifts to Attorney General William Barr, the man who will determine how much of that report to make public — along with what information will be provided to Congress. Here are a few things to know about the 68-year-old Barr. This is Barr's second stint as attorney general. He previously led the Justice Department during the administration of President George H.W. Bush from 1991 to 1993, during which time he was Mueller's boss, when Muller was in charge of the Criminal Division at DOJ. Barr and Mueller are said to be friends, and Mueller attended the weddings of Barr's children. Still, before his nomination by President Trump, Barr criticized some members of Mueller's team for their political contributions to Democrats, and wrote a memo critical of the legal basis upon which Mueller might have been looking into whether Trump allegedly obstructed justice. Barr said in his confirmation hearing in January, however, that the memo was based on what he saw in media reports. He also pledged to allow Muller to complete investigation. Regarding releasing Muller's report, Barr said during his confirmation hearing that his goal "will be to provide as much transparency as I can consistent with the law," but he stopped short of promising to release it in full. In his letter to leaders of the House and Senate judiciary committees Friday, Barr wrote that he intends to consult with Deputy Attorney General Rod Rosenstein and Mueller "to determine what other information from the report can be released to Congress and the public consistent with the law." Barr added that he remains "committed to as much transparency as possible." During his earlier turn at the Justice Department, Barr wrote that President George H.W. Bush didn't need approval from Congress to invade Iraq during the first Gulf War, (although Bush did, in fact, seek and get congressional approval.) 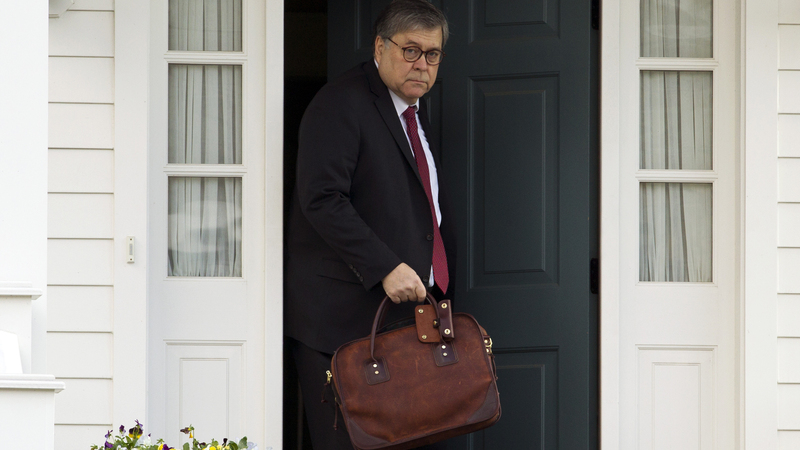 In his memo to top lawyers at the Justice Department before his recent nomination and confirmation, Barr wrote in June 2018 that the president "alone is the Executive branch. As such, he is the sole repository of all Executive powers conferred by the Constitution." In his prior tenure atop of the Justice Department, Barr backed President Bush's pardon of six figures in the Iran-Contra scandal, including former Defense Secretary Caspar Weinberger, who had been set to go on trial for charges about lying to Congress. Barr said later that he believed Bush had made the right decision and that people in the case had been treated unfairly. "The big ones — obviously, the Iran-Contra ones — I certainly did not oppose any of them," Barr said as part of the Presidential Oral History Program of the Miller Center at the University of Virginia. His views on the president's pardon powers are relevant once again, should Trump exercise his pardon authority in favor of any of his former aides and campaign officials who have been convicted or pleaded guilty as a result of Mueller's investigation. Trump has refused to rule out such a possibility. In 1992, Barr wrote a report "The Case For More Incarceration," in which he argued that "there is no better way to reduce crime than to identify, target, and incapacitate those hardened criminals who commit staggering numbers of violent crimes whenever they are on the streets." At his confirmation hearing, Barr said "I understand that things have changed since 1992," but also said he believes law enforcement must "keep up the pressure on chronic, violent criminals. He did, however, commit to enforcing the First Step Act, a criminal justice overhaul passed by Congress and signed by the president last year. And mirroring the views of the Trump administration, in his first term as attorney general back in the early 1990s, Barr tried to limit the ability of people to claim asylum.